Bugis+, the mall formerly known as Iluma, has finally reopened. Known for its illuminated façade and interesting mix of tenants, the former Iluma did not attract even patrons – largely due the lack of a flagship stores, unappealing mix of tenants, and lacklustre F&B outlets. It has opened with Singapore’s biggest Uniqlo, attracting long queues. This didn’t appeal to me though because it was just another Uniqlo. So what’s there to eat at Bugis+? At least they beefed up the F&B selection, with Aloha Ma Maison, Astons Specialities, Bonchon Chicken, Bread & Butter Box, Chef Daniel’s Kitchen, C-Jade HK Cafe In, CoCo ICHIBANYA, Koi Bubbletea, Ramen Champion, Taipei Station, Taste of Hong Kong Café, and Kungfu Paradise. At least there are some new names there. 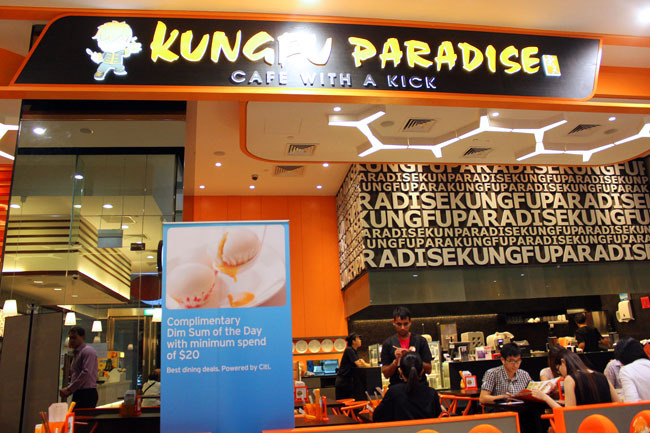 In a “Paradise” mood, I landed at the open concept and orange coloured seats of Kungfu Paradise – the cafe with a kick. 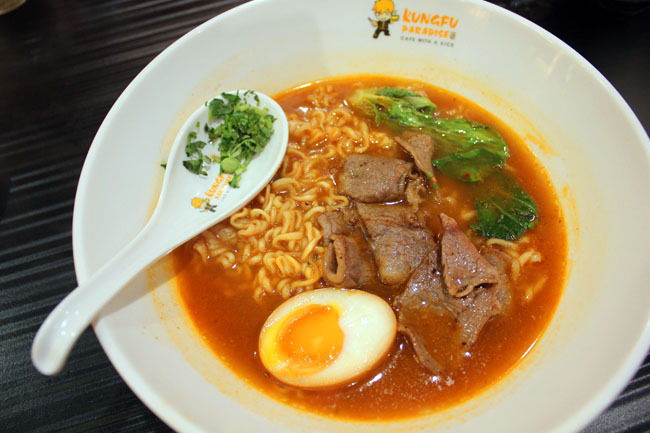 Just like any Hong Kong café which sells mannnnnny things, Kungfu Paradise puts on the dining table popular Hong Kong cuisine (such as dim sum, rice and noodles), Western picks (pasta, sandwiches and toast) and desserts. 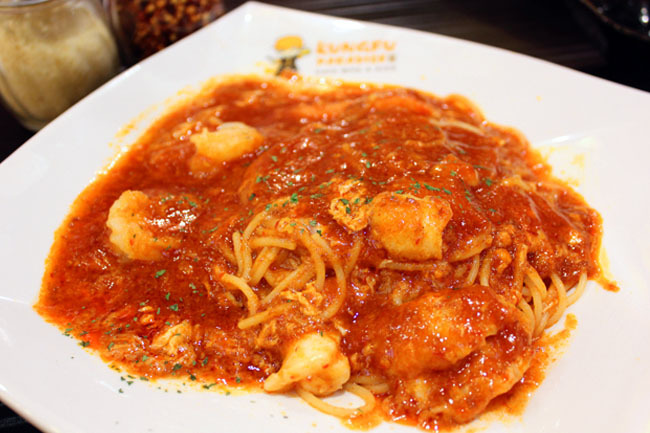 Under the “Recommendations”, I was keen to try Asian-infused flavours in creations such as KungFu ‘Master’ Salad ($5.90) and Seafood Chili Crab Pasta ($9.90) – pasta served with seafood and freshly made chilli crab sauce. 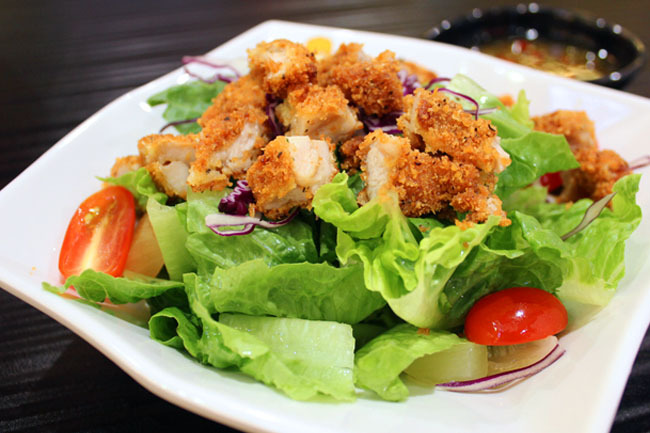 The Master Salad was surprisingly a good choice – a fusion mix of East and West greens with crispy chicken, topped with special Thai spicy dressing. It was a feisty yet refreshing starter. Not meant to be corny, but it does pack a punch! I am usually sceptical of chilli crab ‘anything’, because other versions can come out with cheap tasting sweet gooey sauces. Kungfu Paradise’s pasta was HOT, almost like the real thing, with the noodles swimming in an oily, spicy and fiery mix. Yes, oily. Good news for youths (and bad news for their parents). 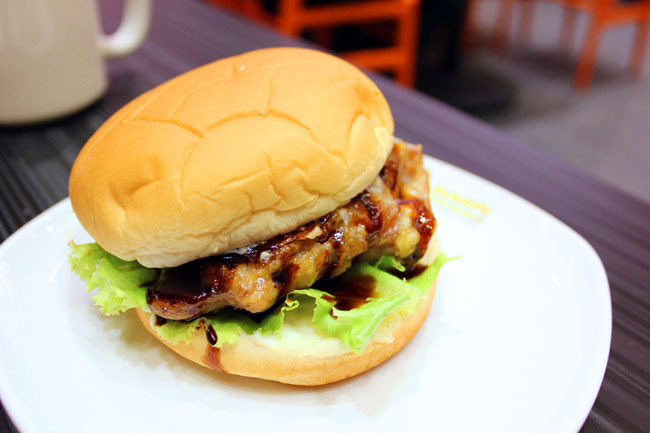 The café which took cues from other Hong Kong cafes is opened past midnight, so you can continue to munch and get fat on their Kungfu Bumgers (didn’t spell it wrongly) after KTV and late night movies. Yeah!